The people of Jamshedpur are very fond of films, theatre, music and dance. They enjoy watching films in open air theatres, in clubs or in various cinema halls spread across the city. The clubs which boast of open air theatres are United club, Beldih club, Golmuri club, Tube Maker's club and G Town club etc. However, these are accessible to members and their dependents only. For others, the cinema halls fill in the need to watch their favourite actors and actresses. People here also watch regional films like Nagpuri, Santhali and Bhojpuri films also. The film city of Jharkhand is known as ''Jollywood''. Film festivals of different countries are celebrated here from time to time and some of the famous films are shown to interested audience in clubs and Russy Modi Centre of Excellence. A Film festival was organized in Ranchi in September, 2012 to mark 100 years of Indian Cinema. Jamshedpur is a picturesque city and hence, a number of ad films, regional films and even Bollywiood films, ''Udaan'' and ''Bubble gum'', to mention a few , were shot here. Jamshedpur is also proud of having a few talented people who have made a mark in Bollywood. Some of these names are Manoj Tiwari, Priyanka Chopra, R.Madhwan, Shilpa Rao, Ravi Kishan, Imtiaaz Ali and Rajdeep. There are no state-of-the-art picture halls in Jamshedpur and people are waiting eagerly for one that will match with the standard of those seen and experienced in metro cities. However, till then, Eylex is one place where the young and old meet to watch the latest release. 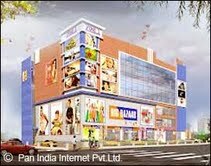 Eylex is the only multiplex cinema hall in Jamshedpur. Other picture halls are Payal cinema, GT Cinema, Shyam talkies.